Two new KALEID feature exhibitions help kick off the 8th year of the South FIRST FRIDAYS Art Walk! 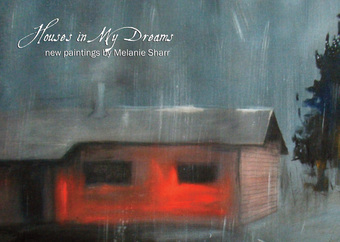 Join us for opening receptions for KALEID artists Melanie Sharr, and Jeff Hemming, two talented painters each unique in their narrative and aesthetic style. The most evident improvement of the Sharks’ effective play is, by far, their chemistry, the most visible of which being executed by the top line of Patrick Marleau, Joe Thornton, and Joe Pavelski. If statistics are an additional indicator, Marleau, Thornton, and Pavelski are all currently within the top five highest point getters in the NHL so far this season, with Marleau and Thornton tied for #1. In addition, Marleau is leading the league in goals, with nine (almost double the second highest), and Thornton is leading the league in assists. Watching Sharks coach Todd McLellan’s assembled lines work in the offensive zone is simply incredible. Occasionally, watching the Sharks execute an offensive zone cycle and fighting in the corners while even strength is like watching the Sharks execute a power play. While the Sharks have been lacking in power play production in prior seasons, they currently lead the league in capitalizing on power play opportunities – burying the puck over 35% of the time. Watch the team work on their power plays. The tape-to-tape passes are crisp. The puck movement is fluid. Pretty rare to see when playing against the best skaters in the world. If anyone is to understand how the best hockey is played, it is all about chemistry between the players. Many fans believe that stacking a team with superstars or with young players is the key to victory, but history proves otherwise. How well can a team pass to one another? Can players effectively receive bad passes? Is it easy for players to get open for passes or shot opportunities? Can the team play well defensively? These are questions that require answering when it comes to assembling (and executing the abilities of) an elite team. Through personal experience and through historical data, the best performing teams have been defensive minded teams with strong abilities to move the puck and have amazing chemistry. Just look at the recent Stanley Cup winning teams as examples. While the Sharks have recently shown an impressive offensive campaign in these first six games (possibly excluding last night’s game versus the Anaheim Ducks), the defense has been equally impressive. Besides outstanding goaltending performance (I mean, look at Antti Niemi so far this season), the defensemen have done a wonderful job as well. One statistic many defensemen pay attention to is blocked shots, a somewhat recent statistic the league has actively recorded, but probably one of the most important overlooked statistics by fans and commentators alike. Blocked shots have changed the game in a significant way, often having teams rely on elite snipers or masterful tip-ins to score goals. A common defensive zone strategy is to crowd the net, since, well, the puck cannot exactly go through players. Even while listening to play-by-play announcer Dan Rusanowsky, the frequency with which I hear “blocked shots” are increasing. It seems Coach McLellan is learning from the success of other defensively minded teams who have adopted an aggressive “cut off all angles” defense strategy. Overall, I firmly believe the Sharks have developed a successful strategy, and it has shown. While currently holding a 6-0 undefeated record so far this season, it is also important to note the great majority of the games have been completely dominated by the Sharks, as they currently have been outscoring their opponents 26-10. This is in direct contract to the equally undefeated Chicago Blackhawks, who have a less impressive 22-13 margin, and in the opinions of many, have been terrific, but not completely dominant, with wins primarily with one goal differences. Hopefully, over time, I will be able to update more frequently and to provide a game-by-game analysis. My direction is more to analyze significant statistics and to look at overall team strategies. If any of you want to see, specifically, who won games, who scored, read obvious information, and to read about bandwagoner/fair-weather “fan” rants from local kids and/or beat reporters, go ahead and use a search engine to find a whole pile of lackluster articles – there’s plenty of those. The perspective I hope to push is one of playing analysis for the die-hards like myself, the same people who attended games since the Cow Palace days, and have been supporting the Sharks through good times and bad. I hope you all appreciate this direction, and please feel free to message and/or provide commentary to help me direct my analysis. As I may have mentioned before, I have created a statistical chart that I am only now starting to use and will eventually post it on this blog publicly for you all to use and manipulate. The Sharks are at home again, tomorrow night, where they face the Edmonton Oilers (for the second time). As many of you remember, the Sharks scored six within the first period last week in Edmonton in front of their sellout crowd. 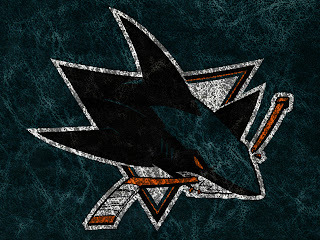 Hopefully, the Sharks can continue their winning campaign at home again, and to beat the Oilers – again. For those of you itching to see scores and statistics, I will list some below for you to marvel at. What a tremendous start to the season! Current record: 6 (wins) – 0 (losses) – 0 (overtime losses), 1 shootout win (an important statistic when it comes to tie-breakers, as a regulation and/or overtime win are more desirable). Until next time, fellow die-hards! Go Sharks! New Walmart Neighborhood Market in Evergreen Opens Today! The Evergreen Village Square will finally have a new anchor tenant. Walmart Neighborhood Market is moving into the former Lunardi's space and is having their grand opening today! This is probably my favorite shopping center in Evergreen. It has a unique configuration with a cool little park in the center, has a view of the hills, and is within walking distance of many homes. It's a shame that Lundardi's left, but I think that the Walmart Neighborhood Market is going to be a much more practical (and affordable) option for the area. SAN JOSE, Calif., Jan. 25, 2013 – Walmart will open a new Walmart Neighborhood Market in the Evergreen area of San Jose on Wednesday, Jan. 30. The store, located in Evergreen Village Square near Aborn Road and Ruby Avenue, is occupying the former Lunardi’s Market space, and will once again provide Evergreen Village with a full-service grocery store. “Walmart looks forward to serving Evergreen Village by bringing a much-needed grocery store back to the Square,” said Store Manager Priscilla Sanchez. “Not only will the Neighborhood Market revitalize the long-vacant building, it will provide additional healthy, affordable food choices for this community. The approximately 41,000-square-foot store features a wide variety of locally produced fruits and vegetables, including those from Ocean Mist Farms, Boskovich Farms, Tanimura and Antle, San Miguel Produce, Earthbound Farm Organic, Naturipe Farms, California Cuties and Foxy Organic, among others. 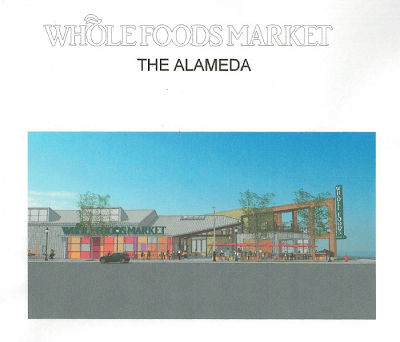 The store will offer fresh bread, as well as meats, cheeses and prepared foods. The self-serve deli will feature rotisserie chicken, fresh-baked pizza and standard deli sides. In addition to the fresh produce, bakery and deli items, the store will carry a full line of groceries, including frozen foods, dairy products, organic items, and an expanded selection of Asian and Mediterranean items. Shoppers will also appreciate the convenience of the store’s pharmacy and its full range of products and services to support the health and wellness of customers and their families. The pharmacy team can answer questions and offer health and wellness solutions. They can also assist customers who wish to transfer their prescriptions to the Walmart Neighborhood Market. The store also sells stationery, paper goods, pet products, hardware items and has a Celebration Station, where customers can buy gift wrap and gift bags, greeting cards and party supplies. Customers can also print their own digital photos at the store. The store will be open from 6 a.m. to 11 p.m., seven days a week. The store will offer Site-to-Store, a free service that allows customers to ship online orders from www.walmart.com free to any Walmart store for pickup. All Walmart stores and Neighborhood Markets participate in the Pay with Cash program. This allows customers to order online at Walmart.com and pay for the items with cash at all stores in the U.S. Walmart is the first major retailer to offer online purchases without the need for banking services or a credit, debit or prepaid card. Approximately 90 part- and full-time jobs were created with the store opening, said Sanchez who started her Walmart career in 2000 as a part-time hourly associate in Tulare. She transferred to San Jose and has worked at Walmart stores on Monterey Highway and Story Road over the past 10 years. She brings a wealth of experience such as department manager, support manager, and personnel manager to the new Walmart Neighborhood Market. The store will host a grand-opening celebration at 7:15 a.m., Wednesday, Jan. 30. Store associates and local dignitaries will participate in a brief ribbon-cutting ceremony. Doors to the new store will be open to the public following the ribbon-cutting ceremony. Special events on grand-opening day include product giveaways and samplings from companies such as Frito-Lay, Coca-Cola, Pepsi, Bimbo Bakeries, Nabisco and more. Chester Cheetah, the Oreo Cookie Man, the Keebler Elf and Bimbo Bear are scheduled to make appearances, and various entertainment events will also take place. Celebration events are also planned for Saturday and Sunday, Feb. 1 and 2. All events are family-friendly, free and open to the public. The grand-opening celebration includes at least $10,000 in grants from Walmart and the Walmart Foundation to local community groups. Recipients include: Alum Rock Youth Center, District 8 Community Round Table, Evergreen Valley Education Foundation, Evergreen Valley High School Band, FAAN Walk for Food Allergy, San Jose Fire Department, San Jose Police Activity League, the San Jose Veteran Center, Shop with a Cop Foundation and Masumoto Elementary School. Additional funds will be available throughout the year for local organizations that serve the community. Walmart will also be announcing $175,000 in grants from the Walmart Foundation’s California State Giving Council. Recipients include Dress for Success Silicon Valley, the Silicon Valley Education Foundation and the San Jose Public Library Foundation. Non-profit organizations interested in learning more can visithttp://www.foundation.walmart.com. About Walmart Wal-Mart Stores, Inc. (NYSE: WMT) helps people around the world save money and live better – anytime and anywhere – in retail stores, online, and through their mobile devices. Each week, more than 200 million customers and members visit our 10,400 stores under 69 banners in 27 countries and e-commerce websites in 10 countries. With fiscal year 2012 sales of approximately $444 billion, Walmart employs more than 2.2 million associates worldwide. Walmart continues to be a leader in sustainability, corporate philanthropy and employment opportunity. Additional information about Walmart can be found by visiting http://corporate.walmart.com, on Facebook athttp://facebook.com/walmart and on Twitter at http://twitter.com/walmartnewsroom. Online merchandise sales are available at http://www.walmart.com and http://www.samsclub.com. Location: 4055 Evergreen Village Square, San Jose, Calif.
* Average wage taken October 2012 See http://corporate.walmart.com for details. Win a Pair of Tickets to Menopause The Musical! The off-Broadway sensation Menopause The Musical is coming to San Jose for 17 performances at the Montgomery Theater between Feb. 6th and 23rd. We are giving away not one, but two pairs of tickets to the opening night performance on February 6th! Ticket prices are ranging between $35-$65. Entering the contest is simple. Just scroll down to the bottom of the page and use the Punchtab widget (just like our Sharks giveaway). You can get bonus entries for liking us on Facebook, following on Twitter, etc. Again, we are giving away two pairs of tickets and they are for the February 6th performance. The contest only runs until this Friday. 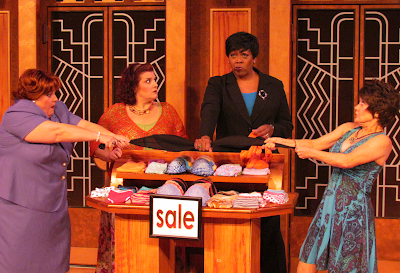 Here is a description of the show: "Set in a department store, where four women with seemingly nothing in common but a black lace bra meet by chance at a lingerie sale. 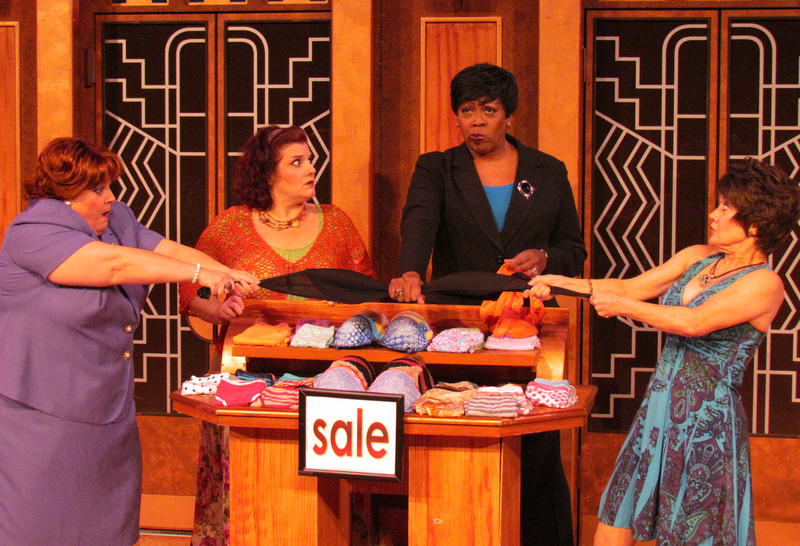 The all-female cast makes fun of their woeful hot flashes, forgetfulness, mood swings, wrinkles, night sweats and more! The laughter-filled 90-minute production includes parodies from the classics of the ‘60s and ‘70s and ‘80s." For more information on the show click here, and to buy tickets head over here. Move Inc., is moving into 32,405 sqft at 10 Almaden and joining more than 70 tech companies located in Downtown San Jose. Malwarebytes and Rosetta Marketing are also moving in to the building. MACLA has purchased the space they were leasing from the city in SoFA and have plans to renovate the space by expanding the art gallery, adding a cafe/retail space, and creating artist/creative entrepreneur studio space. The Irish Innovation Center is transitioning to the SV Global Accelerator, and they will now support startups from all over the world. Don Pedro's at 43 Post is reopening after a remodel. The new First Church is going to be a two-story 21,000 sqft building with a ground-floor sanctuary, community rooms, preschool, a kitchen, and second-floor offices and classrooms. There will be a slick patio on top of the building. The next HER city event is Feb 5th at the Silicon Valley Capital Club, featuring a cooking demonstration, a variety of foods and wine, and even cognac tasting. Typically I would save a stat post like this for Saturdays, but this one is so good that I had to make it a Monday post. The Milken Institute has named San Jose the best performing city of 2012. This is based on increased job growth, increases in salaries and wages, and GDP/productivity growth. Last year San Jose was ranked #51 on the list, so the improvement has been dramatic. San Francisco is #36 on the list and New York is at #11. For those who misguidedly think tech is migrating up north, high tech GDP per capita is over 220% higher in San Jose than it is in SF (and that's including San Mateo, Redwood City, Menlo Park, etc as part of SF). History San José will again host a Bay Area Youth Art Month Exhibition in conjunction with the California Art Education Association (CAEA) opening in the David and Leonard McKay Gallery at the Pasetta House at History Park on March 2. Youth Art Month is a nationally recognized observance each March to emphasize the value of art education for all children, and to encourage support for quality school art programs. Supported by the National Art Education Association and in California by the California Art Education Association, the Northern Area chapter will hold the exhibition featuring some of the best art by Bay Area students, Kindergarten through Grade 12. “The Northern Area of California Art Education Association is honored to bring for the second year in a row to History Park, some excellent two-dimensional and three-dimensional art for exhibition,” said Barbara Purdy, Art Department Head at Presentation High School, and chapter event organizer. 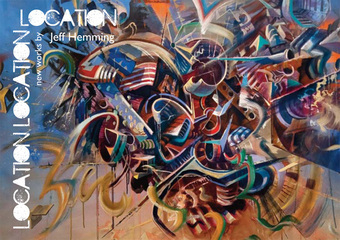 The curated youth art show is open to all California Arts Education Association members. Membership is only $50. The exhibit will include awards for art in four grade-level categories: Kindergarten through second grade, third through fifth grades, sixth through eighth grades and and high school grades nine through twelve. Awards will be given in each category at a Sunday, March 2 afternoon reception from 1 PM to 3 PM at the Leonard and David McKay Gallery at the Pasetta House in History Park. Sargent Art will award prizes to teachers of the first place winners in each category. The student winner from each Area exhibition advances to the state level and one of these students, along with a parent and their teacher, will be awarded a trip to New York through the suppoert of Sargent Art. The exhibition will open on Saturday March 2 at the Leonard & David McKay Gallery at the Pasetta House in History Park in Kelley Park, located at 1620 Senter Road, between Phelan and Keyes Avenues. For GPS mapping use 635 Phelan Avenue. City parking is available for $6. The Gallery is open Saturday & Sunday, admission is free through May 1, 2013. For more information visit historysanjose.org or call 408 287 2290. The Galleries at History Park are open to the public Tuesdays through Sundays, 11 AM to 5 PM, and the Museum Shop and O’Brien’s Ice Cream Parlor are open 11 AM to 4 PM. History Park at Kelley Park is located at 1650 Senter Road, between Phelan & Keyes in San Jose. For GPS mapping use 635 Phelan Avenue. City parking is available for $6. For more information visit historysanjose.org or call 408 287 2290. [California] – Burke Williams is pleased to announce three relaxing spa packages to pamper the ones you love this Valentine’s Day. Each exclusive package, “Romance,” “True Love,” and “For Two” offers a unique combination of soothing treatments and services to create the perfect way to experience romance this holiday. Indulge in “Romance” with a Spa Pedicure and choice of a 50-minute Pure Relaxation massage with enhancement or a 50-minute Spa Style Facial with a peel or brightener starting at $149 ($180 value). Fall in “True Love” with the Spa Pedicure, a 50-minute Pure Relaxation massage with enhancement and a 50-minute Spa Style Facial with peel or brightener, all starting for just $249 ($310 value). Share in a day of relaxation “For Two” and enjoy a couple’s luxurious 80-minute Pure Relaxation massage with enhancements or Spa Style Facials with peels for an exclusive Valentine’s rate starting at $279 ($360 value). Valentine’s Day package specials are available beginning January 25 through February 14 and vary per spa location. Join us at a Burke Williams spa location near you or online at www.burkewilliamsspa.com for gift cards and reservations by location. Let Burke Williams take your love into the spa and beyond this Valentine’s Day. Enjoy a Spa Pedicure with your choice of a 50-minute Pure Relaxation massage with enhancement -or- a 50-minute Spa Style Facial with peel or brightener. Indulge in a Spa Pedicure with a 50-minute Pure Relaxation massage with enhancement -and- a 50-minute Spa Style Facial with peel or brightener. 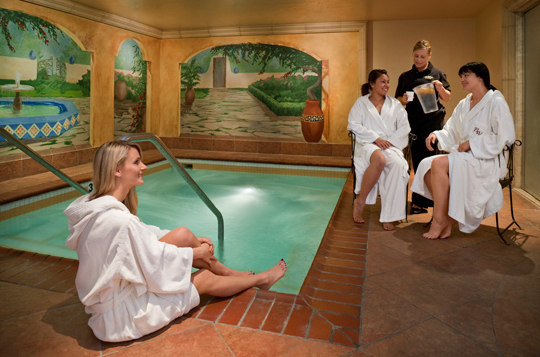 Each of you will enjoy a luxurious 80-minute Pure Relaxation massage with enhancements or Spa Style Facials with peels. Enjoy a Spa Pedicure with your choice of a 50-minute Pure Relaxation massage with enhancement -or- a 50-minute Spa Style Facial with peel. Indulge in a Spa Pedicure with a 50-minute Pure Relaxation massage with enhancement -and- a 50-minute Spa Style Facial with peel. Each of you will enjoy a luxurious 80-minute Pure Relaxation massage with enhancement or Spa Style Facial with peel. Enjoy a 25-minute Salt or Sugar Glo with your choice of a 50-minute Pure Relaxation massage with enhancement -or- a 50-minute Spa Style Facial with peel or brightener. Indulge in a 25-minute Salt or Sugar Glo with a 50-minute Pure Relaxation massage with enhancement -and- a 50-minute Spa Style Facial with peel or brightener. Each of you will enjoy a luxurious 80-minute Pure Relaxation massage with enhancement or Spa Style Facial with peel or brightener. A report has ranked the 60 fastest growing city economies in the world. This includes all of the rapidly growing cities in China (which dominated the list with 34 cities), the Middle East, and Latin America. Only four cities in all of North America made the cut and San Jose was one of them at #46. 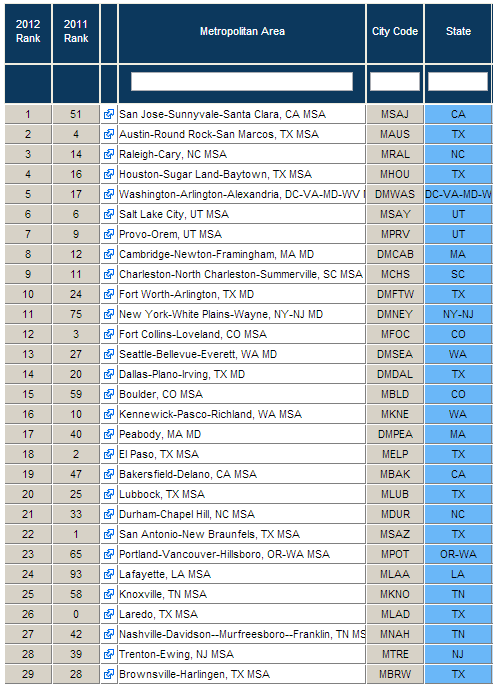 In fact, only one other North American city surpassed San Jose, and that was Houston at 40th place. 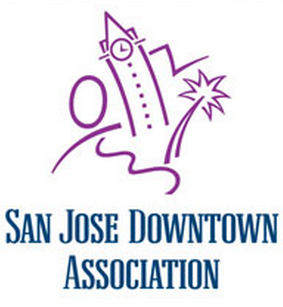 Factors attributed to San Jose's ranking include increases in GDP per capita, employment, and population. Outdoor patio seating on the ground floor corner. This is in addition to the covered outdoor seating on the second floor (where the roof has been raised in this latest design). 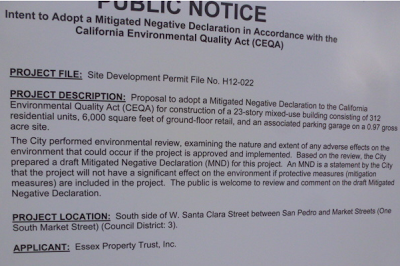 By the way, this building is going to host the first craft brewery to be built into a Whole Foods. New vertical sign at the corner. More colorful facade with more windows. Huge dormer windows on the roof of the Alameda side. I can't wait until this opens! In the middle of all the fervor over software companies in Silicon Valley these days, it's easy to forget that San Jose has a significant manufacturing base and it's still growing. The International Business Park in San Jose has a staggering 8 million sqft or so worth of manufacturing facilities, and vacancy has dropped from 25% to around 10%. Bestronics is a contract manufacturer in that area that provides engineering, testing, and material management services. They are taking a leap of faith and expanding from 25,000 sqft on Ringwood Avenue to 71,570 sqft at 2090 Fortune Drive. The additional space is going to let them add a second shift, take on a lot more work, and expand testing capabilities. It's great to see these types of companies continue to thrive in San Jose despite intense competition overseas. For more info just check out the link below. Wednesday Wishlist: Year Round Snowboarding in San Jose? Once in a while, there are still some proposals that surprise me... and this is one of them. How would you feel about being able to ski and snowboard at anytime during the year... IN SAN JOSE? Well, apparently there is an organization that is trying to do just that. Right now they are trying to collect enough signatures to get the City's attention in building an outdoor snow park at Lake Cunningham near Raging Waters. You can sign the petition at SJsnow.com. Also check out their Facebook page over here. 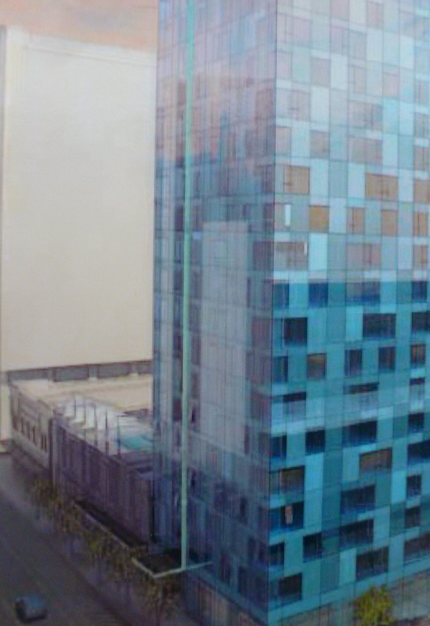 New One South Market Rendering!!! 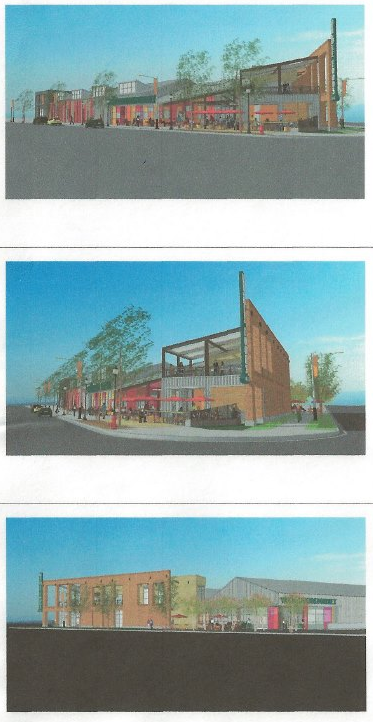 It looks like One South Market has updated their renders and decided not to tell anyone yet. They slapped a new photo at the future building site itself, but I can't find any info about this online. Hat tip to Bobby G. for sending in photos of the new render, this really made my night. 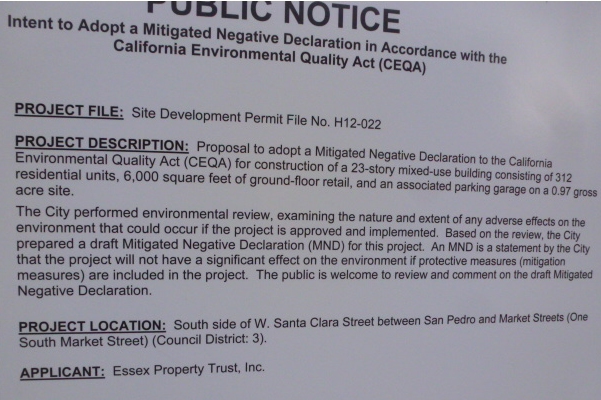 Secondary hat tip for everyone that showed up at the info meeting to complain about the "version 2" design (special mention to Mark from Think Bigger San Jose who created a petition). 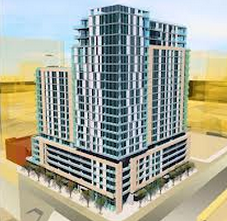 Obviously we are all happy to get any new high-rise building Downtown, but it's safe to say the general consensus was disappointment at the bland and generic redesign for a building that will anchor a key intersection in the very heart of Downtown. Guys, I think you're going to be pretty satisfied with this latest render. The "version 3" redesign looks markedly better than version 2, and even rivals version 1. 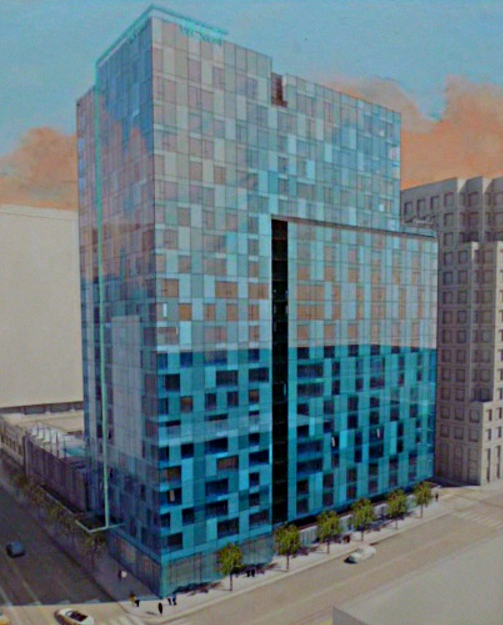 They went from a monotone grid, to a dynamic design incorporating multiple hues, offset windows, and a terrace facing Santa Clara Street. Check out that green/teal line that runs vertically up the Market Street side of the building and then wraps around the corner. Huge improvement! I also added the older renders for comparison. So what do you guys think of version 3?